When individuals discover that they have abnormal cholesterol readings they are often told to initiate lifestyle changes to try to correct them. Based on what physicians and patients have been taught over the last twenty years, the likely dietary change recommended and the easy , first step is likely to be to cut back on dairy fat. Yoplait Original-25% Less Sugar. (but still with 18 grams per 6 oz serving). A typical supermarket/doctor’s lounge yogurt with lots of ingredients added in (sugar, modified corn starch, Vitamin A Acetate, Vitamin D3)to replace the natural good taste and nutrients found in dairy fat. Traders Point Creamery plain yogurt. Ingredients= milk and cultures. Taste =fantastic. Grams of sugar=zero. After all, it’s a pretty easy transition to start using skim milk and non fat yogurt because these line the supermarket shelves and have been filled with chocolate or added sugar to taste more palatable. You might miss the great taste that butter adds to bread or cooking but for your health you would be willing to switch to non butter spreads and cut down on the cheese in your diet because based on what you have heard from numerous media sources this is a giant step toward reducing your cholesterol numbers. Unfortunately, it is a horribly misguided step. Although, the switch to low or non fat dairy lowers your cholesterol numbers, it is not lower cholesterol numbers that you want: what you want is a lower risk of developing stroke or heart attack or the other complications of atherosclerosis. Let me repeat: Don’t worry about your cholesterol numbers, worry about your overall risk of developing heart attack or stroke. Due to 30 years of misinformation, the concept that lowering your cholesterol means lower risk of heart disease has become firmly entrenched in the public’s consciousness-but in the case of dietary intervention this has never been documented. I take care of a 69 year old woman who has an abnormal heart rhythm and chest pain. As part of her evaluation for chest pain we performed a coronary CT angiogram (CCTA) which showed advanced but not obstructive atherosclerotic plaque in her right and left anterior descending coronary arteries. This lady was not overweight, followed a healthy diet and exercised regularly. Her mother, a sedentary, heavy smoker, suffered a heart attack at age 54. Her PCP had obtained lipid values on her 6 months before I saw her which were abnormal but the patient had been reluctant to start the recommended statin drug because of concerns about side effects. After seeing her CCTA I advised that she begin atorvastastin 10 mg daily and aspirin to help reduce her long term risk of heart attack, stroke. She decided without telling me not to take the statin, again due to side effect concerns, but started the aspirin, and began to pursue what she felt were healthy dietary changes. When I saw her back in the office she told me “I don’t eat butter or cheese anymore and I’ve switched to skim milk.” She had substituted olive oil for butter. At first glance, and especially if we focus only on the total and bad cholesterol, this appears to be a successful response to dietary changes: a 29% reduction in the bad cholesterol and a 25% drop in the total cholesterol. However, although the LDL or bad cholesterol has dropped a lot, the HDL or good cholesterol has dropped by more: 40%! This is the typical change when patients cut out dairy fat-the overall ratio of bad to good cholesterol actually rises. 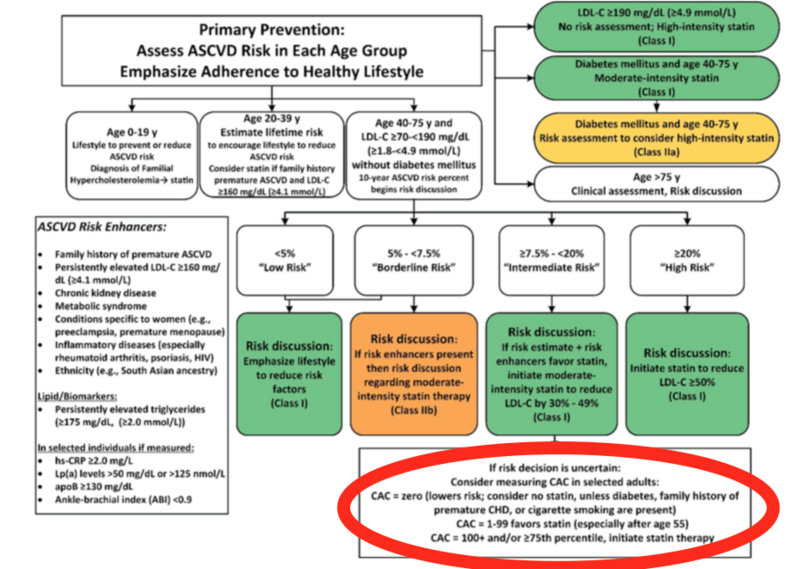 When I plugged both sets of numbers into the ASCVD 10 year risk calculator app (see here) her estimated 10 year risk of heart attack and stroke had actually increased from 7.9% to 8.3%. Current recommendations to consume non or low fat dairy (often accompanied by increase in added sugars) are not supported by scientific studies. Finally, my patient is another example of an inherited tendency to development of premature atherosclerosis: her diet, exercise, body weight were all optimal and could not be tweaked to lower her risk. Such patients must deal with the cardiovascular cards they have been dealt. If they have advanced atherosclerosis, as much as they may dislike taking medications, statins are by far the most effective means of reducing their long term risk of heart attack and stroke.